Justin Hind and Tomek Miernowski are two friends from Madison, Wisconsin who write and record music together, and other than their love of brats, burgers and beer, I'm at a loss to give you any more information about them, except Justin plays the piano and Tomek makes his guitar speak and what lovely soft-pop sounds they make on their most recent EP, I Need To. This kind of soft-pop is hard to come by, but when it's as well done as it is here, it's simply the thing that can break the clouds into song and make the sun bristle through. Neither Justin or Tomek are showoffy in that kind of "Look Ma, it's me!" kind of way; Tomek's tasteful lead electric guitar lines are clean and just-so elastic in a kind of a restrained, Mark Knopfler sort-of way, complementing the beautiful melodies sung expressively and rather smoothly by Justin. Musical ornamentation is fairly spare, with Justin's Ben Foldsish keys providing an amiable base for these five, pretty wonderful songs. The first two songs here are soft-pop classics: the gorgeous, hopeful "Without It," and the should-be, Boss Hit-Bound "Strange Request," with its seductive melody, nicely-building intensity, pretty background vocals and fluid organ-turns-to-rock guitar break. Similarly, the beautiful balladry of the yearning "Blue" (with what sounds like muted banjo in the background) and the typically-melodic "Frozen Flame" strike a melodic chord with soft-pop ears (do I hear a banjo here, too?). The boys stretch a bit instrumentally in the mid-tempo "World On My Shoulder," an atmospheric ballad with ghostly piano and air to spare. It's not often I come upon an album, let alone an ep, that is as complete in every way as this one is. 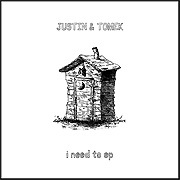 It's Justin and Tomek's third release, and it's a wonderful achievement, and on this Monday morning, it's the thing that's given me hope for the rest of the day.